The MICROanatomy eye model illustrates the microscopic anatomical structure of the retina with choroid and sclera. 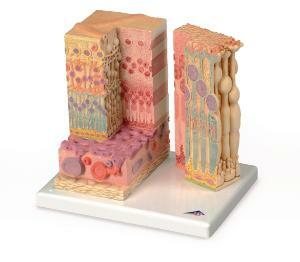 The left side of the model shows the complete structure of the retina including the supplying vascular layer and parts of the sclera. The right part of the eye model is a sectional enlargement. This model shows the microscopic structure of the photoreceptors and the cells of the pigmented layer.